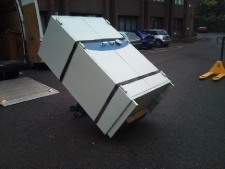 Specialist Lifting Solutions have a team of men dedicated to the removal / relocation of safes, fireproof cabinets and fire safes. Through utilising our specialist lifting equipment, the Powermate Stair climber allows us to relocate safes of various sizes and weights. The fireproof cabinet in the picture is a Phoenix FS1900 Series its dimensions are 1770mm (height ) 1124mm (width) 700mm (depth) its weight was 548 kg it was moved by a team of 4 men in greater london. 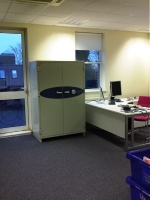 The safe was moved from first floor level and relocated to first floor level of a new building. 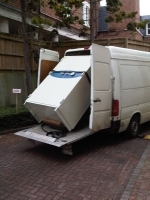 If you need a safe or cabinet moved please do not hesitate to contact a member of our staff. Need to move your safe up or down stairs ? Specialist Lifting Solutions have a team dedicated to stairclimbing safes and fireproof cabinets etc, where access is limited and stairs are the only option. With 10 years experience in moving and relocating safes up and down stairs, call the company with all the equipment and experience necessary. All our staff are trained to the highest standards, and are experienced in moving and delivering awkward and heavy items such as safes. We use specialist lifting equipment, allowing us to move heavy items up or down stairs. For example, fire proof cabinets, commercial and domestic safes, vending machines, large IT equipment, refrigeration & air conditioning units, safes, pumps, cast radiators and range cookers. All of these items up to 700 kg can be move up or down stairs. Home & Office Safes, Eurograde Safes, Gun Safes, Deposit and Drop Safes, Fire Safes, Fire Filing Cabinets, Hotel Safes, Laptop Safes, Medical Safes, Under floor Safes, Wall Safes, Yale Certified.